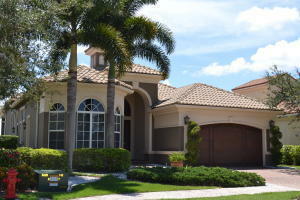 Custom Built immaculate home with 16 ft high ceilings and marble floors. The former model has custom built in cabinets in the family room as well as the den. Top quality appliances with a natural gas cook top and convection oven will make cooking a breaze. Freshly carpeted, the master suite overlooks the pool and has a double lake view. Custom cabinets are found in both walk in closets on the way to the master bath. Huge Roman shower and whirlpool tub are a small part of this amazing space. The home is built like Fort Knox with Hurricane resistant windows and doors, so no shutters for this home. Den/office has new dark wood flooring that accent the custom cabinetry. The pool is large enough for lap swimming and has perfect southern exposure. Call today to see this one of kind value. The content relating to real estate for sale on this web site comes in part from the IDX program of Beaches MLS. Listing content is ©2017 Beaches MLS. This information is not verified for authenticity or accuracy and is not guaranteed. The information provided is for consumers. personal, non-commercial use and may not be used for any purpose other than to identify prospective properties for purchasing. This information was last updated as of date specified below. Some properties which appear for sale on this web site may subsequently have sold or may no longer be available. Please contact Douglas Elliman directly for additional information pertaining to the status and availability of properties displayed on this website. Source: Beaches MLS, Inc. Last date updated: 04/18/2019.